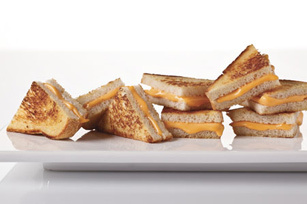 It's all about the presentation with these buttery, triangle-cut grilled cheese sandwiches. Fill bead slices with Singles to make 2 sandwiches. Cook in skillet on medium heat 3 min. on each side or until golden brown on both sides. Cut into triangles. Serve these kid-friendly sandwiches at your next party with cut-up fresh fruit. They're sure to be a hit with young and old alike! For a change of pace, use cookie cutters to cut these gooey hot sandwiches into assorted shapes.